The goal of a good engagement session is to tell your story, and to capture memories of what your love was like before you got married. 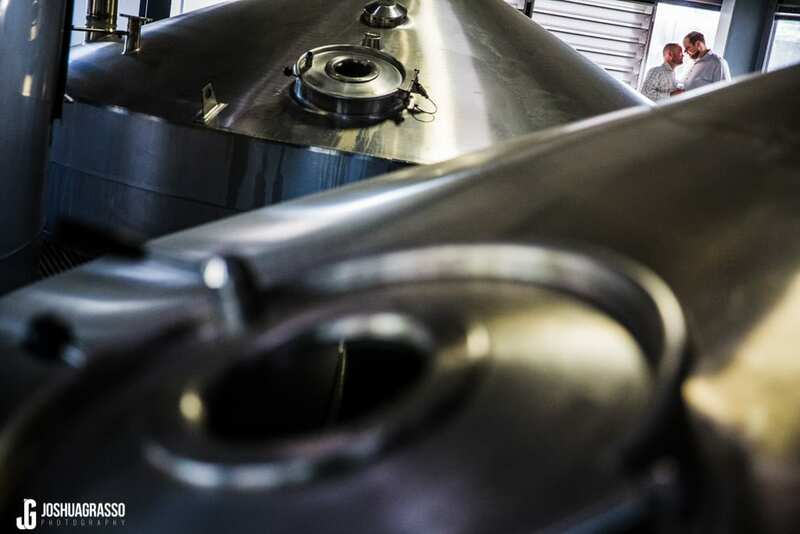 And of course it’s always great to have a little fun. We want to not only get nice classic and candid photos of you and your fiance but we also want to tie in your personalities as much as possible. Nothing is too crazy for your session as long as it fits you. 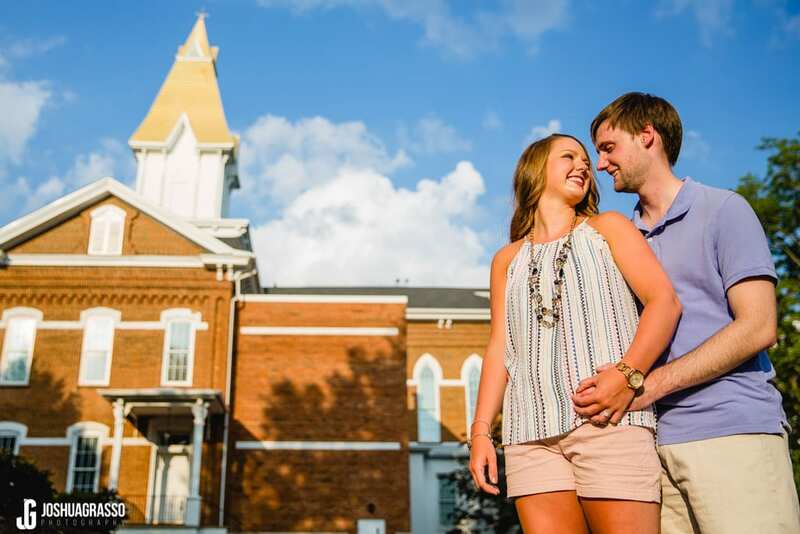 If you’re nervous about trying something different, you can always start your session with traditional photos and then finish with something fun! 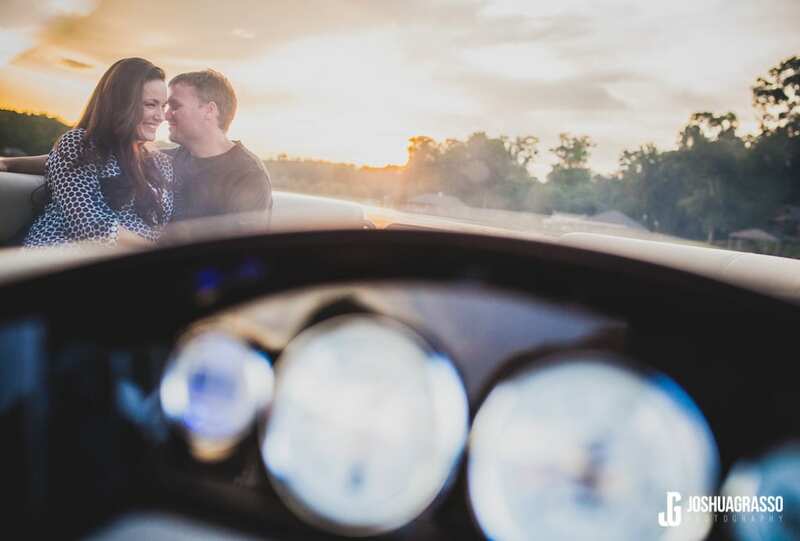 Here are 10 fun Engagement session ideas clients came up with. Do you love star wars ? Then bring the light sabers! 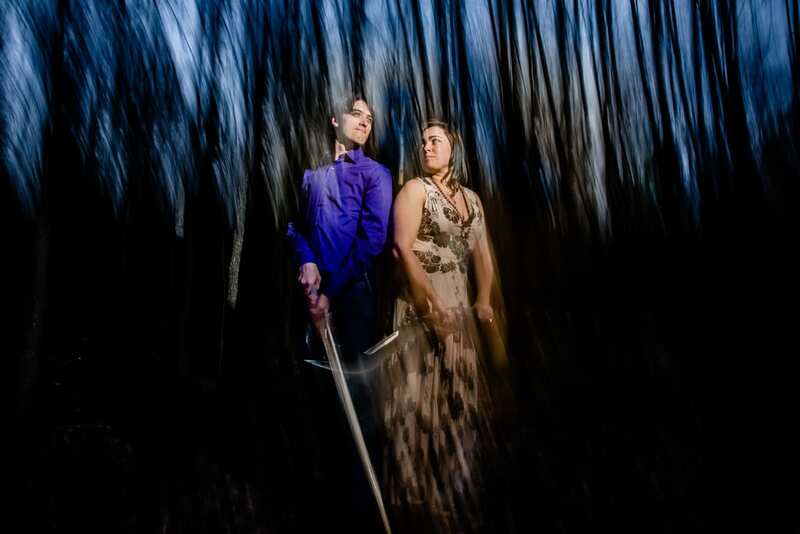 Lauren and Dan brought their favorite swords and light sabers for some cool portraits. Looking extra sharp is a great way to go. Andrew brought a tux and kind of had a little james bond look going making for some fun portraits. If you don’t have any crazy theme ideas, you can get some beautiful scenic shots by hopping on a downtown roof in the evening. Love the same team or even rivals? Throw on your jersey’s for a few shots. Do you love the outdoors? Put on the camo and go out on the range to do what you love. Sydni and Drake love bow hunting together as well as clay shooting. 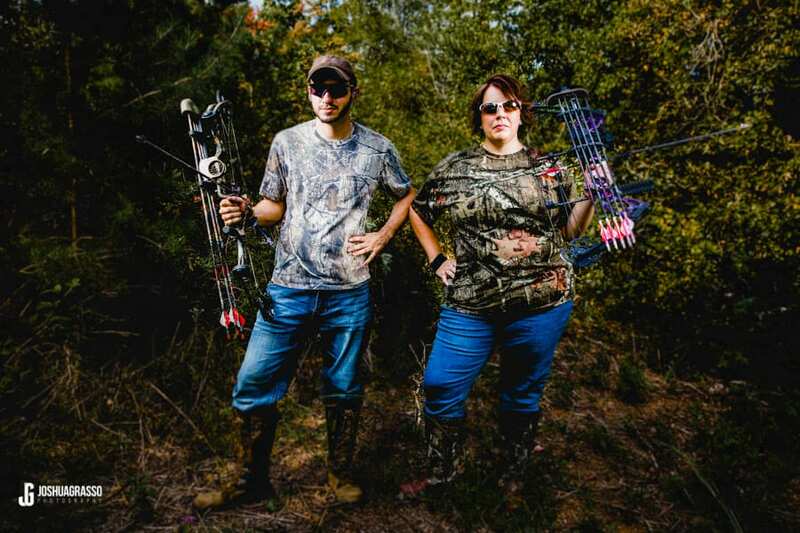 So after some normal photos at the park, we went out shooting and got some portraits with their cool bows and camo. See their fun hunting engagement session here. Have a favorite superhero character? 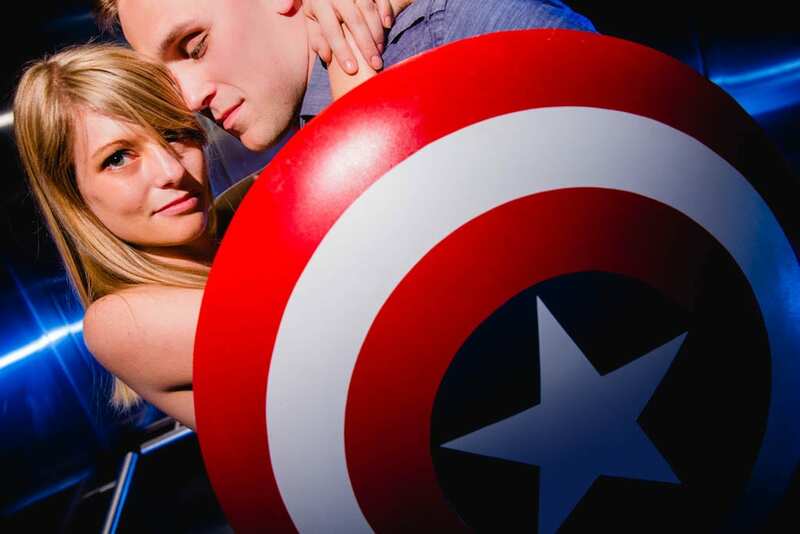 Feel free to put on your superman t- shirt or be like Andrea and Jonathan, who tied in their cosplay hobby by bringing his captain america shield for a fun engagement photo. See more from their unique engagement photos here. Emily and Ryan met at the gym so it was only natural to tie their love for working out into their session. Emily’s dad even laser cut some dumbell covers to spell out their date. 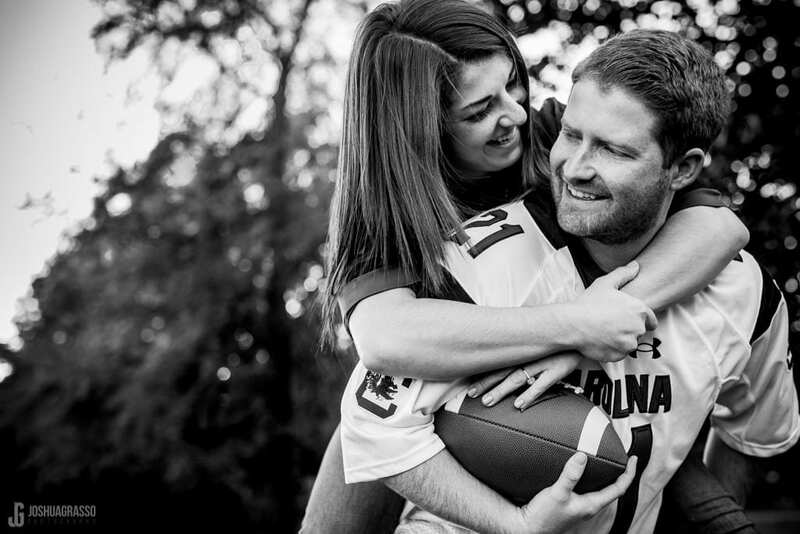 Check out their unique fitness engagement session here. Have a fun idea for a theme?Go ahead and get some costumes and go for it! This was the most unique and creative engagement session I have ever done. 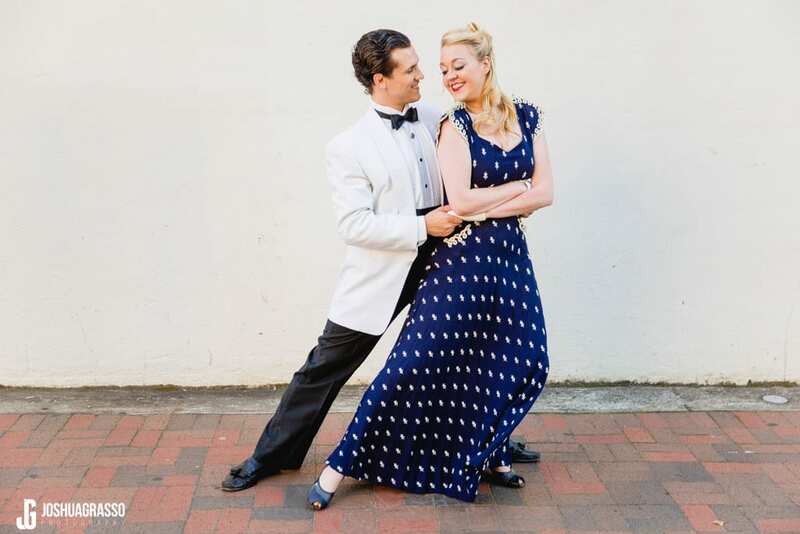 Kara and Quade fell in love on stage in theatre school and wanted to celebrate their love of acting in their session. So they had the idea for a “love throughout the decades” theme. We went to a vintage costume shop and dressed up and then went out on the town. 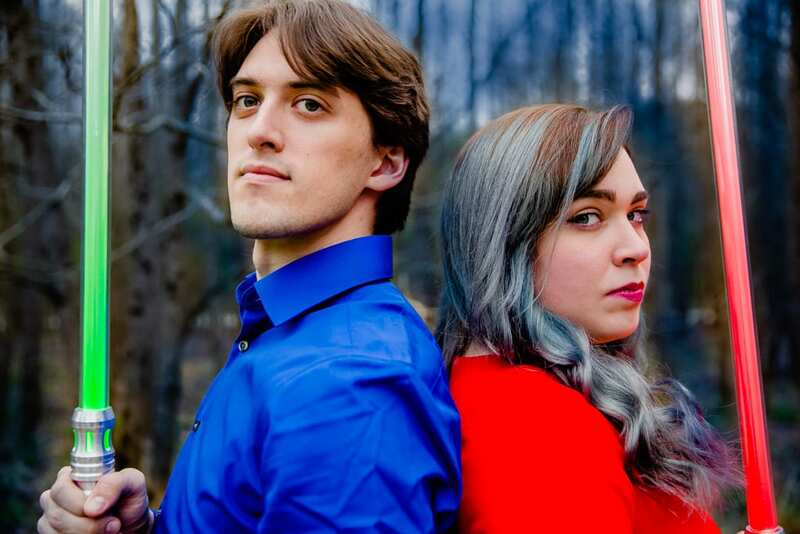 Check out their awesome unique time traveling engagement session here. Sunsets are an old classic backdrop. 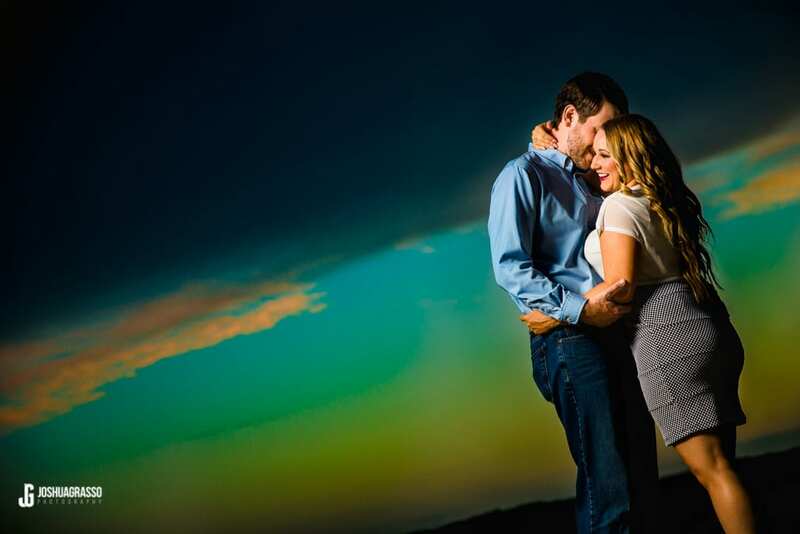 Luckily during this session were were at a vineyards in the mountains with a clear view of the sky. So as the sun went down we got to finish with a stunning sunset view. 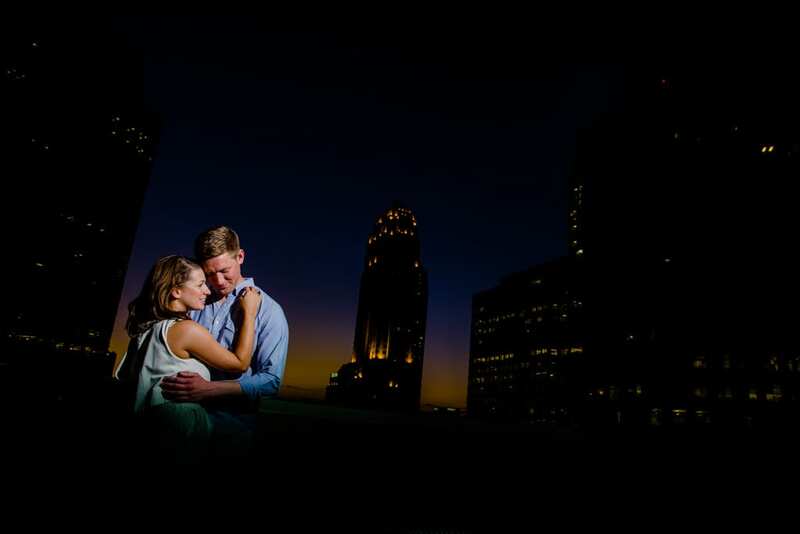 View Kailan and Skip’s sunset engagement session here. 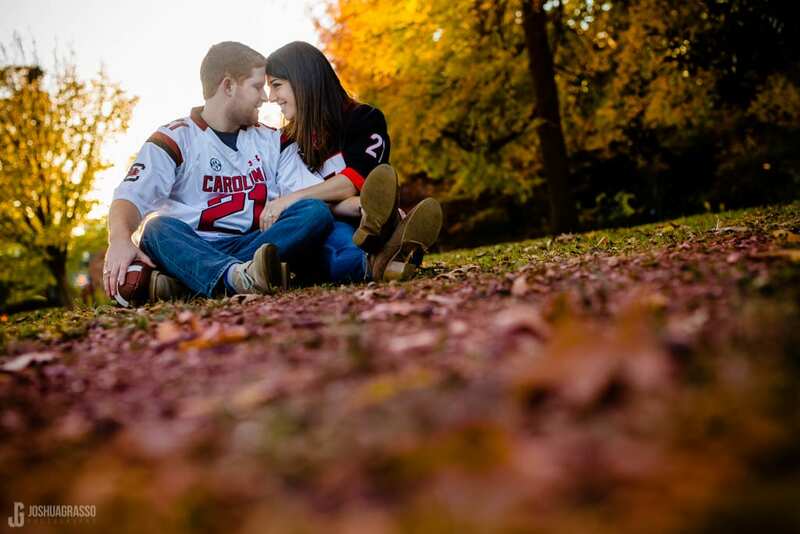 Parks and open fields are quite the trend right now for locations, but you can never go wrong going in the city for your engagement session. It’s much easier to get more variety and more unique compositions. 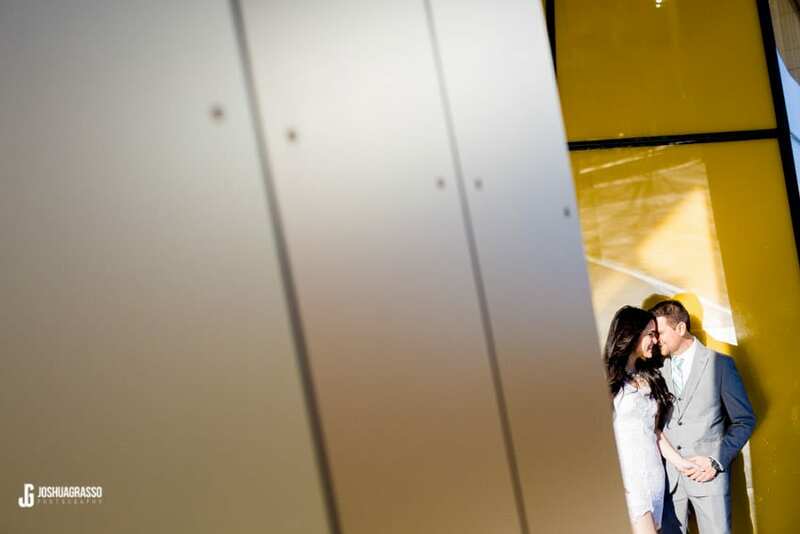 See Liliana and Elvis’s Downtown Atlanta Engagement Session Here. If you don’t have any unique ideas there’s nothing wrong with heading out to the park for a classic session. 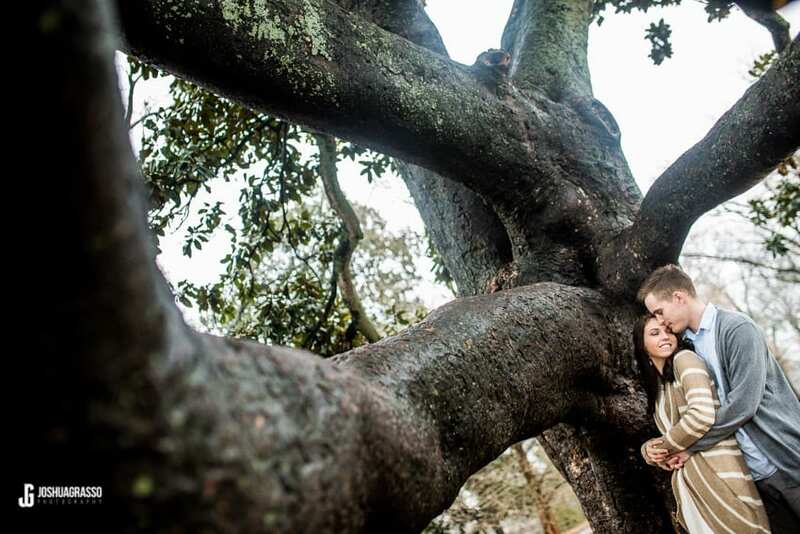 Celeste and Jake tied in their personality just fine by having a good time together and being their goofy selves for their Piedmont Park engagement session here.